It’s time to sign up for the 2019/20 garden waste collection service! 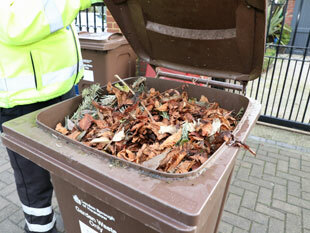 From today (1 Feb) residents of the borough can sign up to the 2019/20 garden waste collection service which will begin on 1 April. The service is a convenient, low-cost way for residents to dispose of garden cuttings throughout the year. Subscribers will be provided with a 240 litre brown wheelie bin or two heavy duty 90 litre sacks, depending on their available storage space. These are then collected on a fortnightly basis from their property by Recycle 360, a company wholly owned by the council. The 2019-20 service will run from 1 April 2019 until 31 March 2020, with a break of two weeks over the Christmas period. Residents are advised to sign up before 1 April to ensure they receive the full service from the start. This will ensure that current subscribers don’t experience any interruption to their service and that new subscribers are set up, have received their bin or sacks and are ready for their first collection on the 1 April. The cost for the service is £50 for the year or £25 for those in receipt of Council Tax Reduction*. Most people will choose to pay for this service by direct debit which you can set up easily online. However, payment can also be made using all major credit and debit cards, except for American Express. People without access to a computer can get signed up by visiting your local library or the Civic Centre where a member of staff will be happy to help you. To date this year, 18,300 households across the borough have signed up to the service and the council has collected around 8,340 tonnes of garden waste which was turned into compost – that’s enough to fill three Olympic-sized swimming pools! “Since its introduction in 2016, the garden waste collection service has become more popular year on year. The service is a hassle-free option for the borough’s busy residents and at just £2 per collection represents great value for money demonstrating the council’s commitment to helping residents recycle in whatever way it can. For further information on the service and to subscribe or renew your subscription for the 2019/20 service please visit www.hounslow.gov.uk/gardenwaste.